Thanks for running! 2018 results are up! Photos are partly up! Despite the cold rain and gloomy conditions on race morning, 102 hardy runners completed the 20th annual Greasy-Gooney 10K! Rixeyville, VA's Rachel Savering, finishing in 45:29, topped the women's field for the second straight year, while Greasy-Gooney newcomer Nelson Mayienda of Winchester outpaced the men in 39:38. Race photos are in the process of being posted on our Facebook Page. Denise Hyde's shots from the start and near the finish are already up, and more photos taken by the race director are coming soon. These photos are free for personal use. (Commercial/professional use is not permitted without permission.) High-resolution versions of all these photos will eventually show up on the RD's personal web space. If you have questions about or problems with the photos, or if you have any G-G photos of your own that you'd like to share, let us know. We cannot emphasize how grateful we are to our volunteers this year (listed here in alphabetical order): Kyra Brown, Karen Geiser (bringer of coffee & donuts), Vern Heavner (president of the Shenandoah Valley Runners and a huge help this year! ), Denise Hyde, Lynne Lawrence, Terry Leckie, Adam Packham (please run Adam's new Heroes on the River Holiday 5K race in Winchester on 12/8! ), Alexander Snyder, Michelle VanHorn, Marisa Varley, and Duane Williamson. If I forgot to mention/credit anyone, please let me know! Thanks as well to Tom Lacombe & O.J. Rudacille Gen. Mdse. ; the Shenandoah Valley Runners; Dr. Normoyle & Browntown Baptist Church; the Comstock, Parsons, & Berry families in Browntown; and the Browntown Community Center Association. All proceeds from the race go to the community center! And finally, the race director would like to thank the 21 participants who contributed an additional $212 for the Humane Society of Warren County. We're so glad we could provide this extra money to help out local animals in need! (Hat tip to Dr. Brown at the Warren County Veterinary Clinic for pointing us to the HSWC.) If anyone else would like to donate to the HSWC, or if you'd like to adopt a pet who desperately needs a home, please visit their web site! If you have any questions or comments about this year's Greasy-Gooney 10K, or if anything eventful happened during the race that you'd like to pass along, or if you have any photos from the race that you'd like to share, feel free to send us a message. Next year's race is tentatively scheduled for Saturday 26 October 2019 (always the fourth Saturday in October)... although the race director admits he's getting a little burnt out and he might want to pass along some or all of the race organizing duties to some new blood. Needless to say, though, we don't want to just let the race die! So if anyone out there might be interested in helping or taking over in 2019, send Karsten an e-mail. Easily the most scenic road race in the Shenandoah Valley, the 20th annual Greasy-Gooney 10K is slated to take place on Saturday 27 October 2018 in the tiny Warren County village of Browntown. You'll be treated to beautiful views of the rural countryside and the nearby Blue Ridge, all at the height of the valley's fall foliage season. Sure, the course is somewhat challenging, but it's worth the effort. This race may be small, but it's one you're not likely to forget. Runners & joggers of all speeds are welcome to participate! If you're planning on participating on Saturday, please take a couple minutes to peruse our Race Day Runner Guide so that you'll know what to expect on race day! Online registration closed on Thursday night, but race morning sign-ups are welcome. Race day registration is from 7:45 to 8:45 AM at the Browntown Community Center. The entry fee is $25 with an embroidered beanie or $17 without a beanie, and running club discounts are available. See the registration page for more info & printable entry forms! We have 93 early registrants, but we'll surely see a few more race day sign-ups. If you've signed up already, you can check our list of registered runners to confirm your entry! We're always in need of volunteers. If you'd like to help out at the 2018 race, contact Karsten Brown by e-mail or at (540) 635-1773. 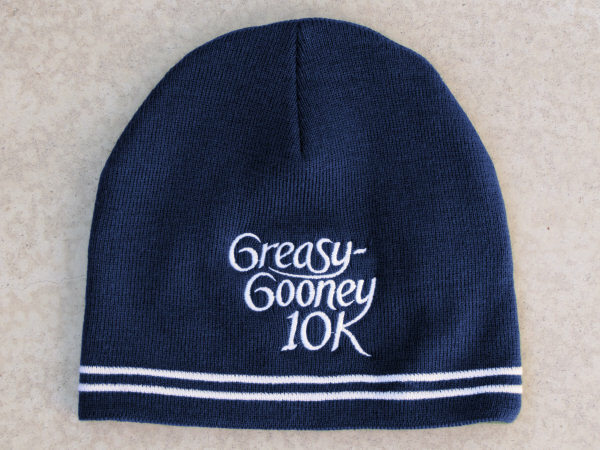 All volunteers (who commit early enough, anyway) will receive a free Greasy-Gooney embroidered beanie! Thanks to Tom Lacombe, owner of O.J. Rudacille's Store in Browntown, for his assistance! After the race, feel free to stop by the store and buy a soda or some chips! Parking, registration, and the finish line are all in Browntown, Virginia, near the intersection of Route 649 (Browntown Road) and Route 613 (Bentonville Road). Browntown is about eight miles south of Front Royal. See the directions page for more details! IMPORTANT NOTE: While parking, registration, and the finish line are all right near each other in Browntown, the starting line is 0.8 miles west of Browntown on Route 613 (Bentonville Road). We don't have any sort of shuttle service, and there is no parking at the start, so you'll have to walk or jog there. Thus, please arrive in Browntown early enough to register or check in before 8:45 AM, so that you'll have plenty of time to get to the start before 9:00! A gorgeous but occasionally tough ten kilometer (6.2 mile) "U"-shaped route starting on Route 613 and following the Gooney Manor Loop up the Greasy Run valley and back down the Gooney Run valley to Browntown. The first half is basically uphill, with 480 feet of elevation gain, while the second half is almost entirely downhill. The course was USATF certified (#VA99025RT). See the course info page for a more detailed description, elevation profile, and maps. And if you want to view some of the scenery beforehand, browse our selection of course photos! We'll have G-G pint glasses & trophies for the top three males and females overall, plus pint glasses & trophies for the top three ladies and gentlemen in the following age groups: 19 & under, 20-24, 25-29, 30-34, 35-39, 40-44, 45-49, 50-54, 55-59, 60-64, 65-69, and 70 & over. We'll also have some mostly inexpensive prizes to hand out randomly during the awards ceremony (including Halloween candy and a bunch of other relatively worthless stuff). See the registration page for more info about signing up for the race! Preregistration is always appreciated. If there are any proceeds from the race, they will be donated to the Browntown Community Center Association. The race director is also soliciting separate donations for the Humane Society of Warren County this year; this is entirely optional (more info). This is a small-ish, relatively low-key event without many volunteers or resources. Please be aware that the course will be open to vehicular traffic, so participants will need to pay extra attention during the race. For safety and insurance reasons, participants may not run the race with personal listening devices (i.e. headphones or speakers), baby joggers, dogs, or unregistered runners; violators will be disqualified and their names will be published (more info). On-site medical assistance will not be available. Entry fees are non-refundable, and entries are non-transferable (more info). If you have any questions, or if you'd like to serve as a volunteer on race day, just contact race director Karsten Brown by e-mail or at (540) 635-1773. For answers to some frequently asked questions, check our Frequently Asked Questions page. The Greasy-Gooney 10K Web pages are maintained by Karsten Brown.